The Theyyam of Malabar photo-expedition is now sold-out. The cost of the expedition includes photo shoots, sightseeing and transfer services as per the itinerary, all accommodations, breakfast at hotels, some meals (Trichhur and barge), a licensed English-speaking guide in some areas, and a driver and ac vehicle for the duration of the travel. It does not include any expenses of personal nature, laundry or any beverages. *We are scheduled to take two internal flights: a Delhi-Mumbai-Kozhikode flight, and a Kochi-Delhi flight. The cost of these flights is not included in the price of the photo-expedition, and are estimated to total around $500. Actual prices will be known closer to booking time. ** A tip kitty of $140 from each participant will be required to be paid separately to cover for gratuities, donations to temples, performers and dancers. International flights to and from Delhi are not included, and must be arranged so that you arrive in India on February 19, 2009. A deposit of $300 is required to secure a place on the Theyyams of Malabar photo expedition. This down payment is fully refundable if notice is given 60 days prior to the departure date. The balance of the cost is due 60 days prior to departure date. Entry visas for India must be obtained directly by all participants from Indian consulates before departure. Entry visas are not granted at Delhi's airport. Our land agent is Renaissance & Rezein India, a Delhi-based travel agent established in 1995. We shall be staying in both large and small hotels, some of which are luxury resorts and others that are more modest. All rooms will have private bathrooms. One night will be spent on a houseboat/rice barge(s). Rooms are cabin-sized but comfortable and also have en-suite bathrooms. I assume no responsibility for accidents or injury to individuals participating in the Theyyams of Malabar photo expedition. You will be requested to read, accept and sign an agreement which releases me from any responsibility of liability in the event of any of the situations mentioned below. I also assume no responsibility if a traveler is refused entry into a country for any reason. It is the traveler's sole responsibility to ensure all travel documents are valid and effective. A passport, valid for six months after the intended date of return is required in many cases for travel overseas. Some countries may require visas for US or non-US citizens. Please check with the corresponding consulates prior to leaving. This is the traveler's responsibility. I cannot assume any liability whatsoever for injury, sickness, damage, death, loss, accident or delay to person or property due to an act of negligence of or default of any travel agent, hotel, carrier, restaurant, company, airline, or person rendering any of the services included in Theyyams of Malabar photo expedition, or by act of God, act of war or terrorism. Further, no responsibilities are accepted for any damage, changes or delays due to sickness, pilferage, labor disputes, machinery breakdown, quarantine, government restraints, weather or other causes beyond my personal control. No responsibility is accepted for any additional expense, omissions and schedule changes, forced stopovers, rerouting or acts of any governments or authority. I reserve the right to decline or accept any person as a member of any tour or to cancel or alter the tour without notice. It is also the responsibility of the traveler to keep informed on deposit and payment date requirements. It is highly recommended that all individuals obtain adequate travel insurance. Ritualistic dances, Kerala Backwaters, Street Photography & Multimedia! This photo-expedition is organized and led by Tewfic El-Sawy (aka The Travel Photographer), and is specifically structured and timed to allow its members to photograph and document some of the most spectacular ritualistic dances of Northern Kerala, called Theyyam. We will travel to the Malabar region of south India, and along with Malabari villagers, attend the Theyyam performances in local temples. Not only will we attend the specific Theyyam rituals scheduled from February 22 to 25, but we shall also encounter smaller Theyyam rituals deep in the forests of Northern Kerala. Theyyam is a form of art worship, more like folk-dance oriented rituals, most popular in north Malabar, Kerala (India). These ancient rituals have their set of traditional costumes and mythological associations, harking back to thousands of years to an era before Brahmanical Hinduism spread to peninsular India. The Theyyam folk-dance oriented rituals usually last for 3 days, and are generally performed in Kaavus or temples. The performances follow a sequence which starts with drum-beats, followed by specific dances and pujas. 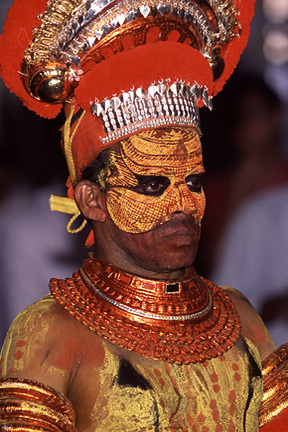 The costumes and masks used by Theyyam performers are intensely colorful, and are made of bamboo splices and red cloth. 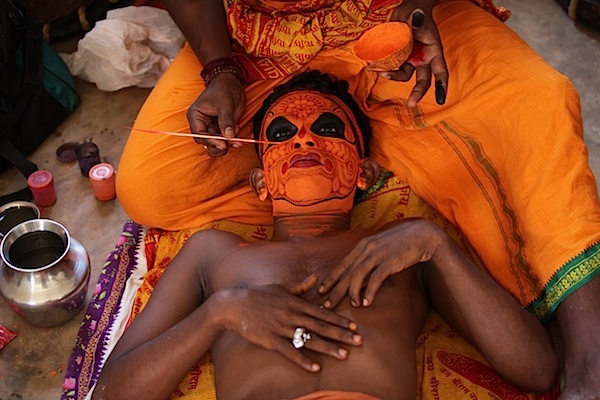 The performers' bodies are painted with locally made concoctions. The performers are called Theyyams and enter into a frenzied state, which allows the deities to inhabit their bodies. At that point, the devotees approach the Theyyams and request their blessings. Also included in the itinerary is a session especially arranged for this photo-expedition at a well known Kathakali dance school, where we will photograph performers applying the distinctive and elaborate makeup, and the ensuing traditional performances. Kathakali is the most well known dance drama from Kerala. 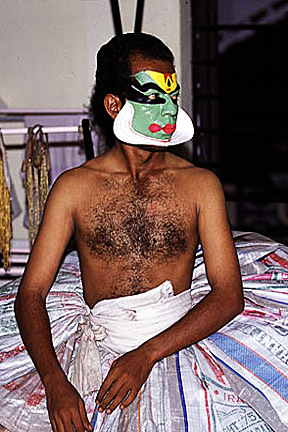 The word Kathakali literally means "Story-Play", and is known for its large, complex and colorful makeup and costumes. This photo-expedition also offers the opportunity to closely photograph ways of life in the villages of the Kerala Backwaters; a unique network of lakes, canals, estuaries and deltas that drain into the Arabian sea. The man made canals connect the villages together and are still used for local transport. The city of Cochin also offers innumerable opportunities for street photography, as well as sites of worship such as its famed Jewish synagogue. Overall, this photo-expedition is perfectly suited for photographers interested in environmental portraiture, documentary photography, and ethno-photography, and presents an unrivaled opportunity to photograph the unique art forms of Malabar in its own true environment. Photographers wishing to produce multimedia projects will be helped to edit their pictorial inventory of the Theyyam and Kathakali photographs, and learn how to control story length, intent, pace, use of music and ambient sound, narration, field recordings and interviews. Important Notice: The Theyyams of Malabar photo-expedition is limited to 8 photographers on a "first registered first in" basis.